Massachusetts shares with the five other New England states a governmental structure known as the New England town. Only the southeastern third of the state has functioning county governments; in western, central, and northeastern Massachusetts, traditional county-level government was eliminated in the late 1990s. Generally speaking, there are four kinds of public school districts in Massachusetts: local schools, regional schools, vocational/technical schools, and charter schools. 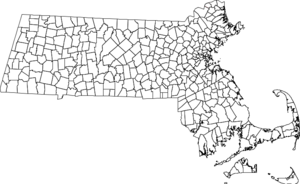 Massachusetts cities and towns. All territory of the state is within the bounds of a municipality. In many other states, a town is a compact incorporated area; between the towns are unincorporated areas, usually quite large, that do not belong to any town. Such states are completely apportioned into counties, and county governments have significant importance, particularly to those living outside towns, and often perform major functions such as providing police and fire services and operating airports. In contrast, all of the land in Massachusetts is divided up among the cities and towns and there are no "unincorporated" areas or population centers, nor townships. (This is generally true of most of the New England states, and is described at length at New England town.) This complicates comparisons with other non-New England states. The U.S. Census Bureau considers Massachusetts cities and towns to be minor civil divisions, equivalent to townships in other states, but townships usually have weaker forms of government. Many Massachusetts residents also identify with neighborhoods, villages, or other districts of their towns and cities. Many municipalities have their own police departments, as do many Massachusetts colleges and universities. Massachusetts State Police have sole authority under state law for investigating homicides, except for Boston, Worcester, and Springfield. Fire protection is generally also provided by municipal fire departments. Massport has its own fire department, and its Fire Rescue provides protection on agency property. Fire departments have mutual aid agreements, such as the Massachusetts Metro Fire District in Greater Boston, which facilitate emergency response across department boundaries. Water and sewer districts are generally operated at the municipal level, providing retail service to residential and business customers, and making provisions for sewage treatment and acquiring water from wells, rivers, or wholesaler. Some local water districts have been consolidated across municipal boundaries and some operate at the sub-municipal (village) level. Running water and sewer service is not necessarily available to all buildings, especially in low-density areas; building owners in these areas must obtain their own water and dispose of their own sewage. The Massachusetts Water Resources Authority provides wholesale water and sewer services to many cities and towns, mostly in Greater Boston, in cooperation with DCR watershed land management. Combined sewers in some areas are being separated to reduce water pollution. Many Massachusetts towns were established during the British colonial period, long before the existence of an independent United States. The Massachusetts Constitution was written before the end of the American Revolution (1780). This constitution re-established the relationship between the state government and the towns which was originally specified by the charter which was granted to the Massachusetts Bay Company by King Charles I in 1629. Many municipalities seek approval for special legislation giving them desired powers, which may or may not be available to them under the blanket grant of Home Rule, due to potentially conflicting state laws. The Zoning Act grants substantial zoning powers to municipalities. The Massachusetts Subdivision Control Law also concerns land use regulation. The distinction between a "city" and "town" as defined in Massachusetts law is primarily related to the form of government that the municipality has chosen. A town is governed under the selectmen and Town Meeting or Representative Town Meeting form of government. A city has a council or board of aldermen (and may or may not have a mayor, a city manager, or both). This distinction dates to the April 9, 1821, when an amendment to the state constitution was approved that permitted a non-town meeting form of municipal government. Prior to that time, each municipality was authorized to be governed by a Town Meeting only. On February 23, 1822, the Governor approved the act establishing "the City of Boston." The new charter was drafted by Lemuel Shaw, later Justice of the Massachusetts Supreme Judicial Court. The voters of Boston approved the acceptance of the proposed city charter on March 4, 1822. The state Constitution stipulates that any municipality that has a population under 12,000 cannot adopt "city" form of government and charter; any "town" with less than 6,000 population cannot adopt a Representative Town Meeting charter and form of government. This applies whether or not the municipality has adopted a Home Rule Charter. Other details of city and town government are left to the legislature. Plan A - "Strong mayor" - Mayor and a city council, the councilors being elected at large. Party primaries prohibited. Plan B - "Weak mayor" - Mayor and city council, the councilors being elected partly at large and partly from districts or wards of the city. Party primaries prohibited. Plan C - "Commission" - Mayor and commissioners. Party primaries prohibited. Plan D - "Council-manager"- City council of seven or nine (one of whom is the mayor), and a city manager. Party primaries prohibited. Plan E - "Council-manager"- City council of seven or nine (one of whom is the mayor), a city manager; members of the council and the school committee elected at large by plurality. Plan F - "Partisan mayor-council" - Mayor and city council, the councilors being elected partly at large and partly from wards of the city, with political party primaries. There are also certain operational differences between cities and towns. A "city" has a clearly structured annual budget process, set out in statute, and the legislative body is prohibited from increasing any appropriation above the amount recommended by the mayor or other chief executive. Changes to town by-laws require approval by the Massachusetts Attorney General, but changes to city ordinances do not. A 1966 amendment to the Massachusetts Constitution affirmed the right of local municipalities to self-government and to the exercise of powers not inconsistent with state law. It also prohibited the state legislature from abolishing or combining cities and towns without their consent, and made it illegal for the legislature to enact legislation affecting only one municipality without that community's request or consent. As part of the amendment, Massachusetts for the first time allowed cities and towns to draft and adopt their own home rule charters without receiving permission or approval from the state. The legislature adopted the state Home Rule Procedures Act to establish a process to accomplish the constitutional mandate. For towns without a home rule charter, changes in the structure of the local government must be approved by petitioning the General Court for special legislation giving it that authority, or through adoption of one of the so-call Acceptance Act Charters, A through F. Communities with home rule charters must also request a Special Act in order to exercise a power the state has reserved to itself, such as increase the number of liquor licenses allowed in a city or town. As of 2000, 71 municipalities had adopted home-rule charters under the Home Rule Amendment procedure, 13 operated under charters granted by Special Acts of the legislature passed before the Home Rule Amendment, and 19 operated under Special Acts pass after the Home Rule Amendment. Out of 53 cities in the Commonwealth, there are now eleven that are legally cities and have city councils, but retained "Town of" in their names. This distinction derives from provisions of state law that reference the town meeting form of government and that provide for greater self-governance authority for the class of communities governed by a form of chief executive and council which are referred to as cities in state law. Communities adopting a city form while retaining "Town of" as their name are: Agawam, Amesbury, Barnstable, Braintree, Franklin, Greenfield, Palmer, Southbridge, Watertown, West Springfield, Weymouth, and Winthrop. Legal opinions provided to charter commissions in some of first of the 11 communities adopting a style of government that the General Laws referred to as a city form suggested that for clarity the community be referenced as "the City Known as the Town of X" as its legal name. The term "town" was retained in many cases because a suburban community did not desire to be known as a "city" with the urban issues the name implies, but wished to adopt the city form of government. How a municipality refers to itself has been said to be a decision that is up to the community. The Massachusetts Supreme Judicial Court has ruled that what a municipality calls itself doesn't matter: "It is the substance of the thing done, and not the name given to it, which controls". Opinion of the Justices to the Senate, 229 Mass. 600 (Mass. 1918). The "City known as the Town of" reference was intended in communities adopting it to assert its right to exercise the authority of a city in governance, municipal finance and procurement. In the early days of the spread of the council-based municipal government to towns, it served to eliminate confusion as to a town's ability to do a particular thing. Prior to the adoption of the Home Rule Amendment, no town had become a city in Massachusetts for 45 years, while four made the change in the first 10 years following the adoption of home rule. Local property tax. The Legislature has authorized local governments to administer the property tax under state supervision, and to set property tax rates locally. A 1980 law, passed by popular ballot and known as "Proposition 2½," sets limits on property tax and automotive excise tax rates. There are three parts to the property tax limit calculation. Levy Ceiling: A community may not, in any one year, collect more than 2.5% of the total full and fair cash value of all taxable real and personal property in the community. Levy (Increase) Limit. The annual increase of the amount collected cannot exceed 2.5% over the previous year, plus the amount corresponding to increased property values. New Growth. Each year, the state Department of Revenue calculates a "new growth" figure for each municipality, allowing that community to increase its levy a certain amount beyond the 2.5% limit to account for value-adding improvements in the local property stock, such as the subdivision of farms to high-priced homes. A municipality is permitted but not required to tax up to the levy limit. If a city or town wants to raise more money than it is allowed under either the ceiling or the increase limit, it must get voter approval for a "Proposition 2½ override" or a "Proposition 2½ debt exclusion." An exception is granted for water and sewer debt. Tax increases voted through a debt exclusion must be tied to a certain cost and expire on a future date; an override increase sets a new benchmark for all future 2.5 percent rises. Some municipalities have a state-authorized property tax exemption for low-price owner-occupied residences of up to 30%. Local income tax. The Massachusetts Constitution was modified in 1915 to permit a state income tax. However, the constitution requires that "such tax ... shall be levied at a uniform rate." This means that local municipalities may not impose a local income tax. Local sales tax. The Massachusetts Constitution requires tax rate uniformity, which means that municipal governments may not institute local sales taxes. However, some exceptions have been granted. In 1985, the Legislature granted cities and towns the right to impose sales tax on aviation fuel and hotel/motel occupancy, as a local option. Local aid. A significant portion of the income of cities and towns comes from the state government's general fund, and is known as "local aid". Fees. Some municipal fees, such as parking fines and towing fees, are limited by state law. Unfunded mandates. State laws which place requirements on cities and towns without increasing financial support to cover increased costs are often criticized as "unfunded mandates" and are a controversial issue in local relations. In theory, Proposition 2½ disallowed unfunded mandates after 1981, and in some cases this has been successfully enforced in court. However, the courts have ruled that the legislature may condition other aid on acceptance of the mandates, partially circumventing the law. District attorneys and sheriffs are elected by constituencies that mostly, but not entirely, follow county boundaries; they are funded by the state budget. Though most county governments have been abolished, each county still has a Sheriff's Department which operates jails and correctional facilities and service of process within the county. The government of Nantucket County, which is geographically coterminous with the Town of Nantucket, is operated along similar lines — the town selectmen (executive branch) act as the county commissioners. Mismanagement of Middlesex County's public hospital in the mid-1990s left that county on the brink of insolvency, and in 1997 the Massachusetts legislature stepped in by assuming all assets and obligations of the county. The government of Middlesex County was officially abolished on July 11, 1997. Later that year, the Franklin County Commission voted itself out of existence. The law abolishing Middlesex County also provided for the elimination of Hampden County and Worcester County on July 1, 1998. This law was later amended to abolish Hampshire County on January 1, 1999; Essex County and Suffolk County on July 1 of that same year; and Berkshire County on July 1, 2000. Chapter 34B of the Massachusetts General Laws allows other counties either to abolish themselves, or to reorganize as a "regional council of governments", as Hampshire and Franklin Counties have done. The governments of Bristol, Plymouth, and Norfolk Counties remain substantially unchanged. Barnstable and Dukes Counties have adopted modern county charters, enabling them to act as efficient regional governments. Dukes County in particular has a strong regional planning agency known as the Martha's Vineyard Commission. Administrative divisions of Massachusetts Facts for Kids. Kiddle Encyclopedia.